SILVER SPRING, MD – The Montgomery County Planning Board, part of The Maryland-National Capital Park and Planning Commission, has launched an interactive online tool that monitors and tracks development in downtown Bethesda against the overall cap on development. It also tracks the availability of Bethesda Overlay Zone (BOZ) density. The information from this website will be used to periodically report to the Planning Board, County Council and the community about the progress of development in downtown Bethesda, and it can be accessed by the public at any time. 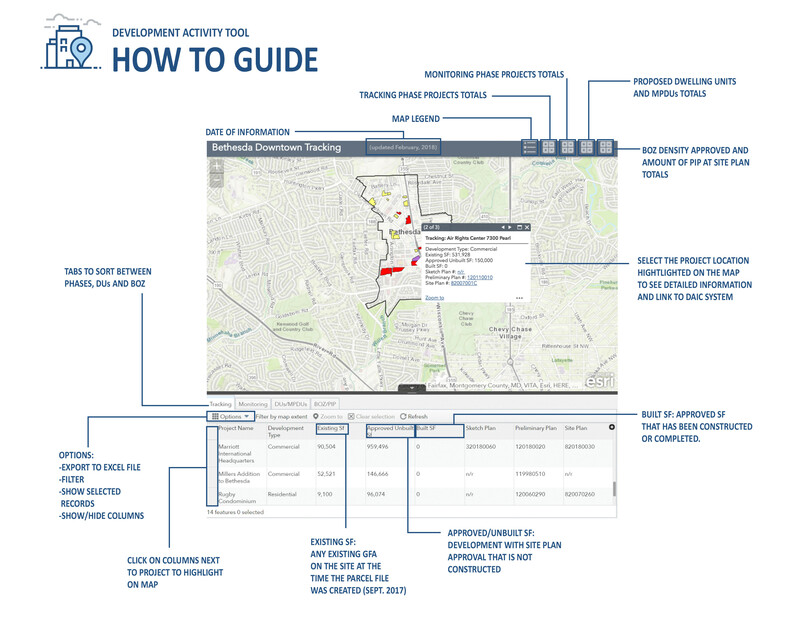 Planning staff collaborated with the Implementation Advisory Committee, a 14-member group of residents and property owners established to monitor the implementation of the Bethesda Downtown Sector Plan recommendations, to ensure the development tracking tool is simple and user-friendly. In February 2018, staff provided the Planning Board an overview of the monitoring and tracking program webpage and a status update on the Implementation Guidelines and the Annual Monitoring Report currently being developed. The monitoring and tracking website is located at montgomeryplanning.org/bethesdadowntowndev. The interactive mapping tool monitors and tracks development activity at the Sketch Plan, Preliminary Plan and Site Plan stages of development. Information on the website includes the existing and proposed square footage, proposed land use, number of dwelling units, number and percentage of moderately priced dwelling units, BOZ density allocation requested by the property owner and approved by the Planning Board, and amount of the park impact payment (PIP) for each project at Site Plan approval. The interactive tool allows users to download the information from the tables into an Excel spreadsheet as well as navigate the location of the projects using the interactive map. The map also links the user to the project application documents via the Planning Department’s Development Activity Information Center. The 2017 approved and adopted Bethesda Downtown Sector Plan is being implemented through focused coordination between public and private interests. The plan’s goals and recommendations focus on enhancing downtown Bethesda over the next 20 years and achieving a truly sustainable downtown. Parks and open space, affordable housing, environmental innovation, economic competitiveness and design excellence are the focus of the plan. The plan’s vision will be implemented through various actions, including zoning, a park impact payment (PIP) and annual monitoring and reporting of development. The process for the Bethesda Downtown Sector Plan led to the creation of the BOZ, requiring developers to meet strict standards for density, building heights, affordable housing, parks and open spaces, and design quality, in addition to other plan recommendations. The County Council adopted the BOZ in July 2017, which can be found in the Zoning Ordinance under Section 59.4.9.2. To ensure transparency and accountability in the implementation of the Bethesda Downtown Sector Plan, BOZ and design guidelines, the Planning Department has been preparing numerous tools to aid the Planning Board, property owners, planning staff and the public in achieving the objectives. The new Monitoring and Tracking Program is one of those tools. For more information about the new online tool and Bethesda Downtown Sector Plan, contact Leslye Howerton at leslye.howerton@montgomeryplanning.org or 301-495-4551.